How can virtual servers be moved between hypervisors of varying brands and models across different environments? Virtual servers need to be moved between different models and/or different brands of hypervisors within or across different environments. The virtual server is converted and/or exported into a common, supported format that is imported into the destination hypervisor. 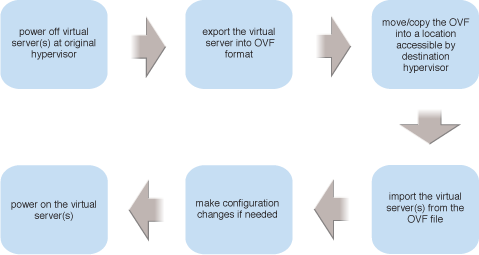 The OVF format is the most commonly used and supported format for virtual server exporting and importing. 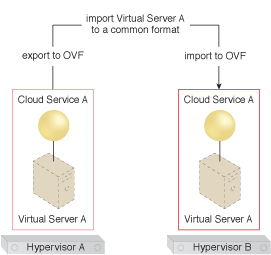 Virtual Server A is exported to an OVF package at the origin hypervisor, and then imported from the OVF package to the destination hypervisor. 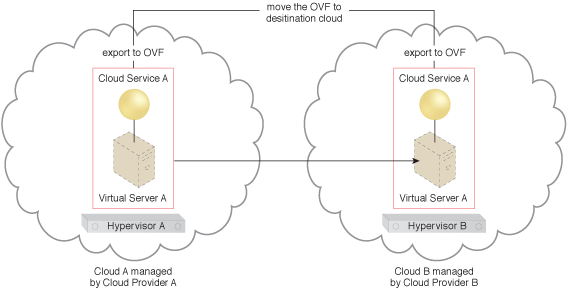 Virtual Server A is exported into an OVF package at Cloud A, and then imported from the OVF package into Cloud B. The six steps involved in the application of the Cross-Hypervisor Workload Mobility pattern.